Shortly after dawn on Wednesday the 29th June 1927, mid summer, a rare total eclipse of the sun took place over Wales, hitting first Pen Llyn and then moving north east directly over Pwllheli, Snowdon, Conwy then over Lancashire and North Yorkshire at Darlington and finally out in the North Sea. The area of total eclipse was 32 miles wide and at any spot on this track the total eclipse would last for 23 seconds. This eclipse was well advertised and thousands of people came to what was then Caernarvonshire to view the event, many hundreds of them climbing the hills and mountains to hopefully get an uninterrupted view of a rare astronomical event. Many people including parties of school children had climbed the higher peaks the day before and camped out particularly on Cader Idris and Snowdon. Still more children with teachers had travelled through the night to reach a vantage point. Remember, this is mid Summer and it is Wales, and of course the predictable weather arrived. The Caernarvon & Denbigh Herald (as spelt at the time) reported the event extensively in its edition of the 1st July 1927 and extracts from this paper are reproduced here. CRICCIETH – Hundreds of students from north and south Wales came by special trains, cars and charabancs, Visitors totalled over 6000. Mr.Lloyd George was at his home with Mrs.Lloyd George, Lady Cary Evans and Miss Megan Lloyd George. PORTHMADOG – Despite heavy rain crowds congregated on Borthygest Hill and Moelygest. BANGOR – A very wet morning with only a momentary deepening of the gloom was the experience of the visitors here. CAERNARFON – In spite of the continuous and heavy downpour some hundreds ventured out of doors hoping they would see something. On the Tuesday evening 50 boys from the Lewes Grammar School accompanied by their headmaster arrived at Caernarvon en route for Snowdon. They were met at the station by the Deputy Mayor and the Town Clerk. The boys left for Llanberis in the evening and went up Snowdon by train shortly after 3am on the Wednesday morning – unfortunately they saw nothing. SNOWDON & LLANBERIS – Hundreds of people from all parts of England and Wales made their way to Llanberis on the Tuesday, and throughout the day and that evening, traffic was very heavy. All the hotels and boarding houses were full of visitors eager to go up Snowdon by foot and by train. The Snowdon Railway had arranged to run trains to the summit between 3.30 and 4.30am on Wednesday morning. Two hundred people went by train and as there was not enough shelter in the two wooden huts of the Summit Hotel, most were drenched to the skin. An astronomer had suggested installing a wireless set on the summit in order that accurate time signals could be received. This was in fact done, officials of the Radio Society of Great Britain set up a five valve Halcyon portable wireless and were able to receive time signals from the transmitting station at Daventry. Other parts of Wales in the path of totality also reported heavy overcast rainy weather, and it was only further to the north west that weather conditions were favourable and the local paper reported that at Giggleswick in Yorkshire that the eclipse was perfectly seen. The crowds were struck dumb by the sight of the corona glowing like a volcano, and cheered when the sun reappeared. There are historical references to eclipses in Wales from Brut y Tywysogian, or, the Chronicle of the Princes, the following being merely one of them. 807 And then died Arthen, king of Ceredigion. And there was an eclipse of the sun. There was partial eclipse on the 11th February 807. There are again references for solar and lunar eclipses in Wales for the 4th November 830, the 20th March 1140, the 1st May 1185 and the 23rd June 1191. There were total solar eclipses on the years 639, 878 and 1023 but these are not referred to in the Chronicle. 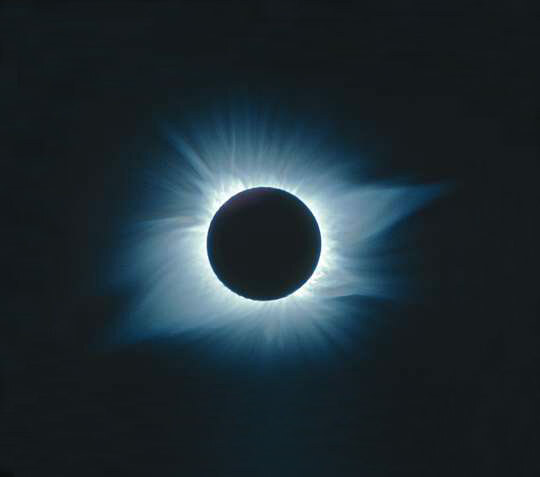 It is a pity that the total eclipse of the sun on the 29th June 1927 was not observed in Wales for the next opportunity to see a total solar eclipse in Wales will be limited to Flintshire on the 14th June 2151, and as it will be mid summer, no doubt it will rain. My thanks go to web pages from Bristol and Nottingham Universities, University of Wales Press, Cardiff, 1955 and the Caernarfon and Denbigh Herald. Many thanks to Patrick Allely for this fascinating piece of history.